McIntosh Gallery is not hosting any offsite programming at Satellite Project Space (121 Dundas St., London, Ontario) at this time. For more information about Satellite Project Space, including public gallery hours and current exhibitions and programming, please visit their website here. April 28 - May 12, 2018: "Wall with Door"
Image: Jamelie Hassan, Wall with Door, 1977, acrylic on wood with door and metal hardware, McIntosh Gallery Collection, gift of Bill Stelpstra and Andrew Smyth, London. McIntosh Gallery is pleased to present its recent acquisition, Jamelie Hassan’s Wall with Door, at Satellite Project Space. First exhibited at Forest City Gallery in 1977, Wall with Door references Hassan’s travels through Colombia and Mexico in 1975-76 and her subsequent eviction from, and the demolition of, her London studio the following year. In the work, painted tropical Anthurium flowers are set against lush green foliage. The inset door salvaged from the artist’s studio opens onto a similarly painted interior panel, dissolving boundaries between entrance and exit, what is inside and out, and relative feelings of placement and displacement. Wall with Door mimics the blurring of boundaries between cultures and language often tied to travel, and highlights their ultimate fluidity and transience, itself operating in a state of flux. McIntosh Gallery thanks Bill Stelpstra and Andrew Smyth for donating this important work to the permanent collection. Born in London, Ontario and raised in an Arabic-speaking household, London-based artist Jamelie Hassan explores the dichotomies of East and West, interior and exterior, centre and periphery, and responds to issues that arise from life in a culturally diverse society – a subject that is exceptionally resonant at this moment in time. She was awarded the Governor General’s award in Visual Arts in 2001, and has works in collections of The National Gallery of Canada (Ottawa); The Art Gallery of Ontario (Toronto); The Glenbow Museum (Calgary); The Morris and Helen Belkin Art Gallery (Vancouver); Museum London (London) among many others. July 5 - July 19, 2018: "Condensation (A Cove Story)"
Image: Michael Snow, Condensation (A Cove Story), 2009. Video projection, Blu-ray, colour, silent. 10:28min. Looped. Collection of McIntosh Gallery. McIntosh Gallery is excited to present Condensation (A Cove Story) at Satellite Project Space. This 10-minute silent looped projection by Michael Snow premiered at McIntosh Gallery in 2009. The work is a part of the McIntosh Gallery permanent collection but has not been exhibited in London, Ontario since its inaugural presentation. 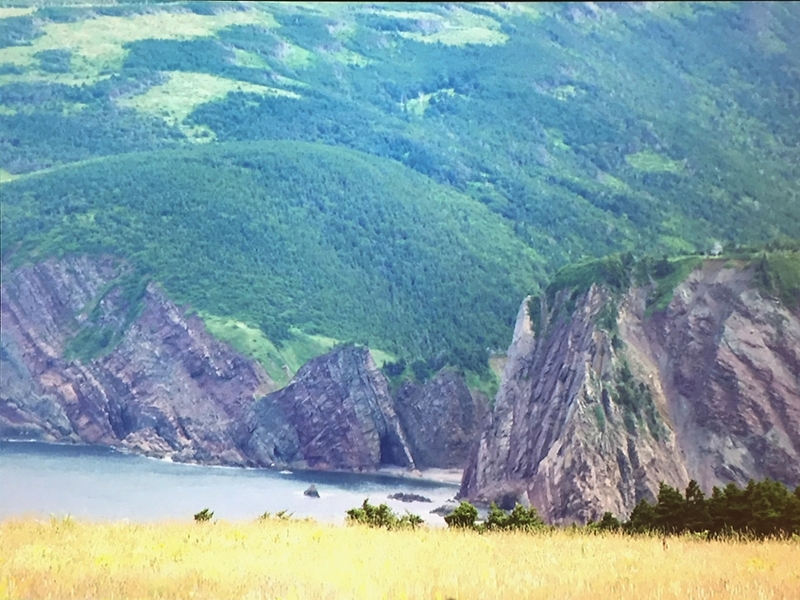 Referring to both temporal and meteorological conditions, Condensation (A Cove Story) was created using time lapse photography at Snow’s cabin near Cape Anguille on Newfoundland's west coast. It is a compressed, condensed recording of an evolving series of weather-events and the resulting shifts of light and colour on the wild coastal landscape consisting of the mountains, the windswept fields, the rugged cliffs and rocky shoreline, and the Atlantic Ocean. Michael Snow, born in 1928 in Toronto, is one of Canada’s best known contemporary artists. He is accomplished in wide array of media, including film, video, photography, music (performance and composition), painting, drawing and sculpture. He has also produced a number of book works, sound installations and holographic exhibits. Retrospectives of his work have been exhibited at the Hara Museum (Tokyo), Centres Georges-Pompidou (Paris), the Museum of Modern Art (New York), the L’Institut Lumière (Lyons) and the Palais des Beaux Arts (Brussels), and others. In addition to numerous prestigious awards including the Chevalier de l’Ordre des arts et des letters, France, the Order of Canada, the Governor General’s Award in Visual and Media Arts, and a Guggenheim Fellowship, he has also received an honorary doctorate from the Université Paris 1 Panthéon-Sorbonne and several honorary degrees from a number of Canadian universities. His work is held in the collections of the National Gallery of Canada (Ottawa), the Art Gallery of Ontario (Toronto), the Museum of Modern Art (New York), the Museum Ludwig (Cologne and Vienna), the Centre Georges-Pompidou (Paris) and the Tate (London), among others. Snow lives and works in Toronto, Ontario. This exhibition is presented by McIntosh Gallery and installed at Satellite Project Space.